In my post about bulletproof kinks, I mentioned how much I love novels that feature the close relationship between sisters. Well, I've found a new one — but ooooh mercy, this ain't Sense and Sensibility! 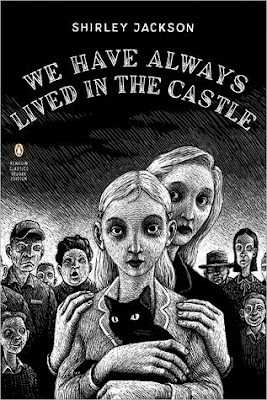 We Have Always Lived in the Castle's narrator is 18-year-old Mary Katherine Blackwood, known to one and all as Merricat. For the past 6 years, since the deaths by poisoning (arsenic in the sugar bowl) of her parents, brother and aunt, she has lived in the family home with her dear sister Constance, her cat Jonas, and her uncle Julian, an invalid slowly dying from the effects of the poison. Given the shocking nature of the case and the subsequent acquittal of Constance on all charges, the remaining Blackwoods have become pariahs. Aside from Merricat's twice-weekly errands to the library and the grocery store (all the while fantasizing about walking on villagers' corpses), their rare contacts with the outside world consist in awkward afternoon tea with guests too fearful to let any refreshments touch their lips. Everything runs in an orderly fashion, with precise tasks assigned to every day and each inmate having their own duties. Constance, who handles all of the cooking and gardening, is never happier than in her beloved kitchen; she is patience itself with her frequently trying sister and uncle. Merricat is the self-appointed protector of the house; abiding by her arcane rules and maintaining the physical and intangible safeguards she has put up around the grounds is almost a full-time job. Uncle Julian has made it his life's work to chronicle every single detail of that fateful day when he lost his wife, brother, sister-in-law and nephew, to the point where he often confuses past and present. The trio is content with their quiet existence, but when Merricat notices that the notebook she'd nailed to a tree has fallen to the ground, she knows that something terrible will soon trouble their peace. This was such a pleasure to read! There's something almost feral about Merricat that reminds me of myself as a child, and the loving relationship between the Blackwoods in such a singular context is all the more touching. I think this novel would be just the thing for a rainy weekend. I borrowed this book from my library network through ILL.